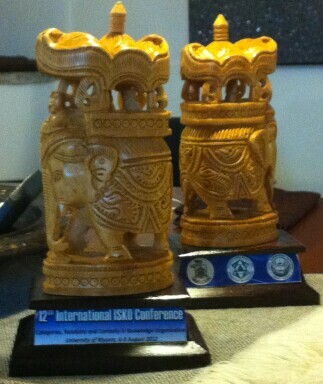 At the 12th International ISKO Conference in Mysore, I gave the “keynote” address at the opening session. 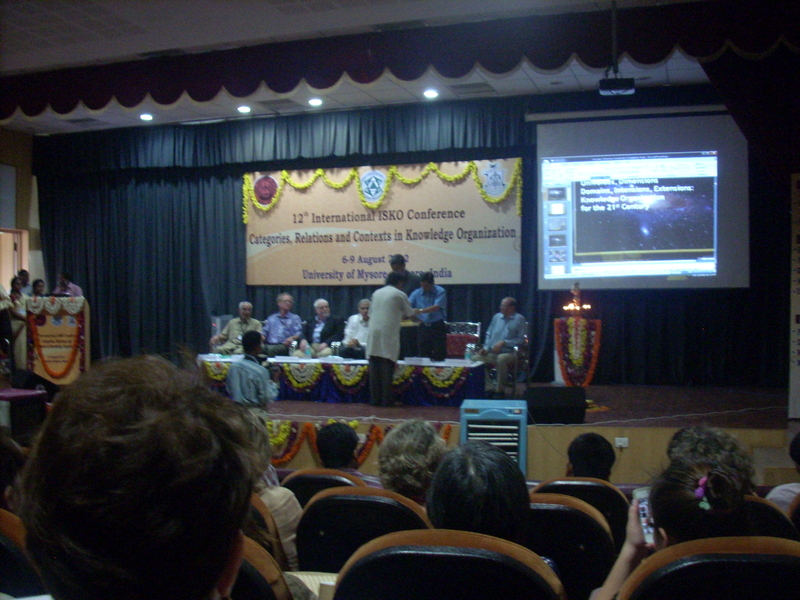 The preliminary text of the paper is in the proceedings, which all conference-goers received on site. 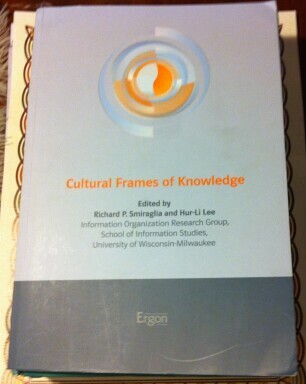 Printed copies may be acquired from Ergon-Verlag in the West, or in Asia from the Sarada Ranganathan Endowment for Library Science (srels@dataone.in or ksragav@hotmail.com). 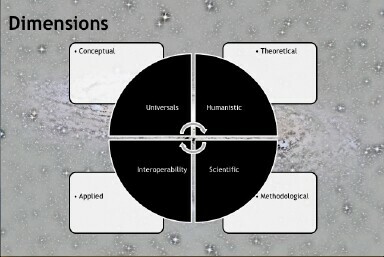 In KO there is work to solidify concept theory, which is at the core of our discipline; but there are other dimensions, as well as suggestions that classification must engage a multi-verse. This paper encompasses a domain analysis of KO as a means of visualizing the emergence and coherence of our domain, and as a way of denominating the parameters of the universe (or universes) in which our domain operates, as well as the dimensions of the operational paradigms at work. 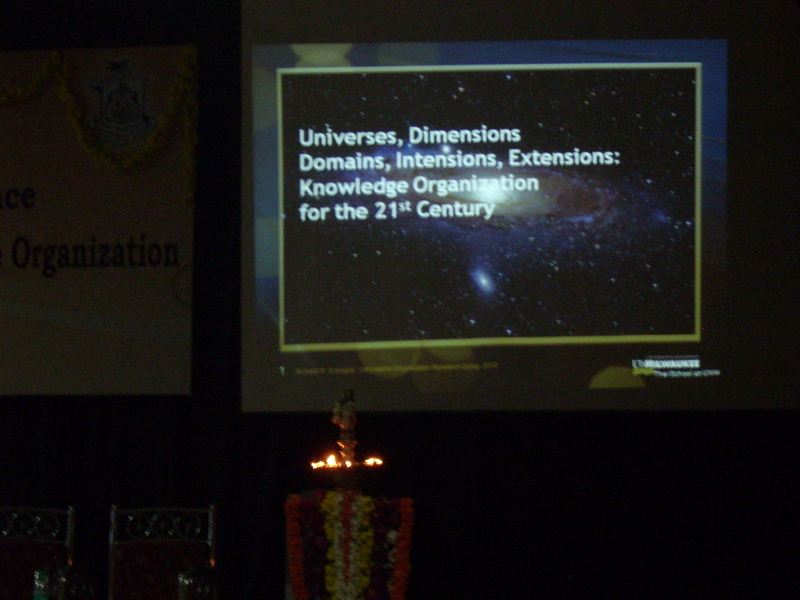 In other words, we look here at the extension and intension of KO as a domain. KO as a domain demonstrates coherence across time and across geo-political boundaries, particularly as it concerns its theoretical foundations. Consistently marked dimensions within the domain: theoretical versus applied on one continuum, humanistic versus scientific on another. These dimensions serve to maintain constructive and dynamic tension within the domain, which in turn keeps the research front constantly in a state of renewal. The four quadrants of the dark circle in the center illustrate the extension of KO, which has shifted temporally from the search for universal classification to attempts to increase interoperability, and the methodological continuum in the domain, which stretches from empirical science to humanist narrative. The background quadrants represent the shifting intension of the domain, which runs from concept theory to applied systems. -not be constrained by shifting extensions, but embrace them as boundaries for faceted dimensions (rather than concretizing, see social tagging as a dimensional hallmark for re-perceiving indexing, etc. ; use ontogenetic approaches to move KOS from concrete fixed systems to systems that are flexible in a time-space dimension, etc. -embrace methodological pluralism by more fully embracing epistemological contexts—empiricism as qualitative, for example, or historicism as part of the time-space dimension. To say it was an exciting event is the understatement of the century in KO. 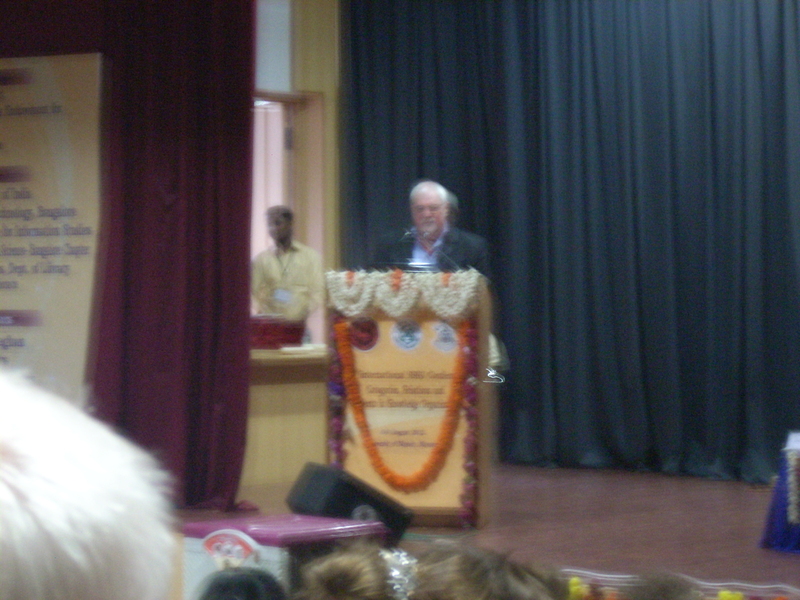 We had four jam-packed days of contributed papers, invited sponsored lectures, Indian dance, Indian food, and Indian culture. 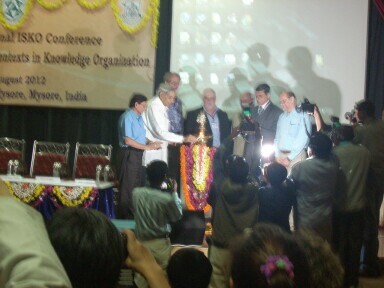 The opening ceremony was the most elaborate I’ve ever seen, with the lighting of the torch of knowledge: a choir to sing the anthem of the university, and the launching of IOrg’s new book Cultural Frames of Knowledge, , which was presented in a package of golden paper, unwrapped on the dais by Prof. Naik (a noted physicist) and the president of the university. I gave the keynote really, I did . So there. The text (except the last bit) is in the proceedings. Appalling was the near total absence of North Americans and western Europeans. There were about 6 Americans, 2 Canadians, a couple of French and Germans. There were a host of Brazilians, who turned out in force. Even more appalling was the number of papers from North Americans who did not show up but had them read by people who did.